Adam Serwer at MSNBC reports that a conservative group is at it again, using social media to post the wrong damn thing, and further widening the gulf between them and the minority voters they desperately need to court if they want a shot at winning future elections. 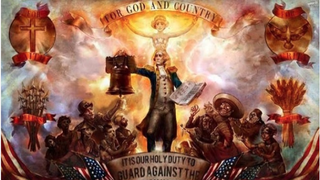 The National Liberty Federation, formerly known as the South Florida Tea Party (the name change a result of the group's rebranding effort to distance itself from Tea Party stigma), posted the photo above from the video game BioShock Infinite. "Well, it is an anti-immigrant cartoon … where it's used as propaganda for the Founders, a jingoistic, xenophobic group that runs the floating city of Columbia. They're the video game equivalent of the Tea Party, and they're portrayed as a nasty group of racist white men." So much for rebranding, NLF. Good luck with all that.